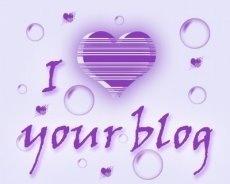 I have just a few minutes to post today (I have a crazy busy day), but last week Mizz J from Being High Maintenance, Not Bitchy awarded me the I Love Your Blog award and I wanted to thank her. Ninu Nina– A new blog to hit my radar. It’s about music, pop culture and my other biggest vice—fashion. Running With Heels- The hottest on-line magazine dedicated to shoes.